On the final day for presenting candidacies for president, Knesset Speaker expects the unexpected. Tuesday is the last day for submitting candidacies for the position of president of Israel, but Knesset Speaker MK Yuli Edelstein (Likud-Beytenu) estimated that that there may be last-minute surprises in the list of cadidates' names. MK Edelstein stressed, however, that he is talking about a gut feeling, and not any substantiated information, and that he does not know who may yet surprise everyone by presenting his or her candidacy. Six candidates have collected the required ten signatures of support from MKs, and two of these presented their candidacies to Speaker Edelstein Tuesday morning. 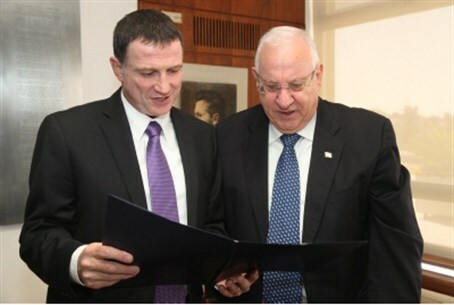 These are the two leading contenders for the job, MK Reuven Rivlin (Likud-Beytenu) and MK Binyamin Ben-Eliezer of Labor. The speaker expects to see MK Meir Sheetrit (Hatnua), ex-MK Dalia Itzik, retired judge Dalia Dorner and Nobel Prize laureate Prof. Dan Shechtman at his bureau in the course of the day, too. They still have to hand in their signed candidacy forms. Although there is very little time left, sources close to former minister David Levy are still not ruling out the possibility that he will garner the required signatures and present his candidacy. Estimates in the Knesset are that if a seventh candidate materialzes, he will be Levy, who is reportedly under pressure to join the race. If Levy does run, he will probably damage Rivlin's candidacy more than any other's, seeing as their voter bases are similar.